Siena is a small provincial capital, located in a magnificent hilly area of Tuscany; city of art, it was declared by UNESCO World Heritage Site in 1995. Siena has Etruscan origin: "Sena Etruriae" was in fact the name of the first settlement. It was conquered by the Romans during the Republican period and became a military colony in the Augustan Age, called "Sena Julia". The development of the city occurred only in the Middle Ages, preceded by a change of institutions: after the Lombard hegemony, the Frankish kings and the power of the bishops, Siena organized itself as a "comune"; starting from 1147 the city was ruled first by consuls and then by potestà and captains of the people. In the XIII century, during the conflict between the Empire and Papacy, Siena supported the Ghibellines; the significant imperial privileges that it received as a prize, decreed the economic progress of the city, spurring the work of both the bankers and enterprising merchants. The Medieval history of Siena was characterized by the dispute with the Guelph Florence: in 1260 Siena defeated Florence and all its allies during the Montaperti battle but, only nine years later, Siena was defeated in Colle Val d'Elsa by Florence, backed by Charles of Anjou. 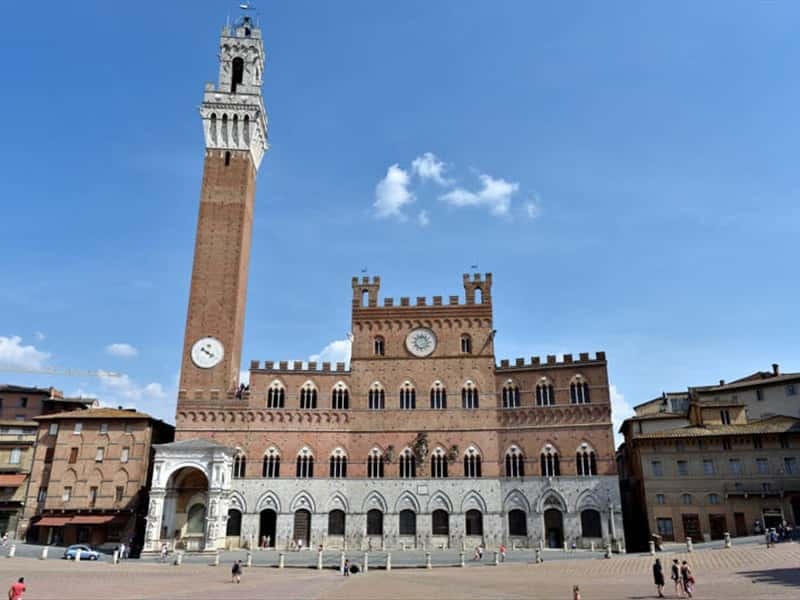 From that moment, despite the defeat, a period of political stability started for Siena: during the Guelph government, lasted until 1355, the conflits with Florence ceased and were built many of the magnificent monuments that still adorn the city. Social evolution also has a positive impact on the cultural and artistic aspect: in the XIII century Siena founded one of the first Studia in Italy and in the first half of the XIV century an important painting school included artists as Duccio di Buoninsegna, Simone Martini, Pietro and Ambrogio Lorenzetti. After that period of peace there was a long period of strong internal tensions. After the lordship of the trader Pandolfo Petrucci, Siena fell under the imperial influence. In 1555, after a long and tragic siege, it was conquered by Charles V and Cosimo de' Medici and annexed to the Grand Duchy of Tuscany. 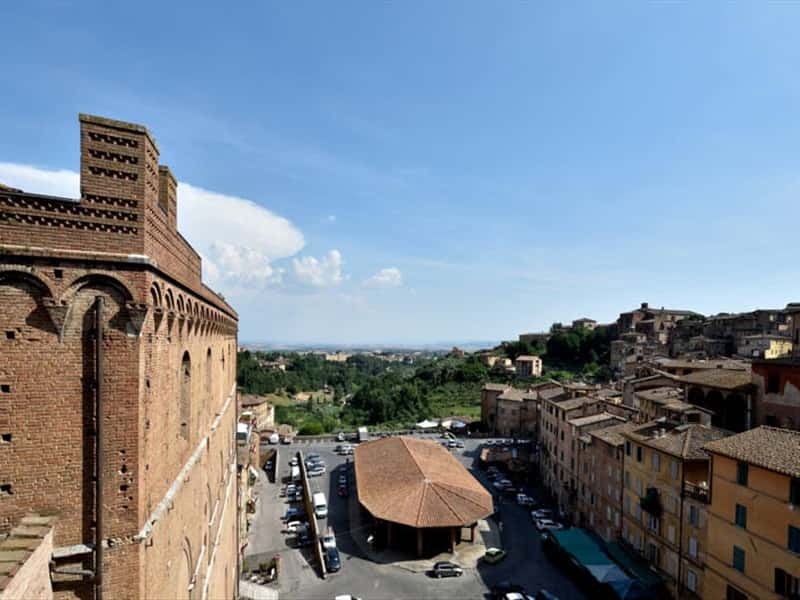 The Medieval and Renaissance excellence makes Siena a place of historical and artistic interest: the historic center of the city, enclosed by the XIV century walls with long and winding streets, has its heart in the famous shell shaped Piazza del Campo. 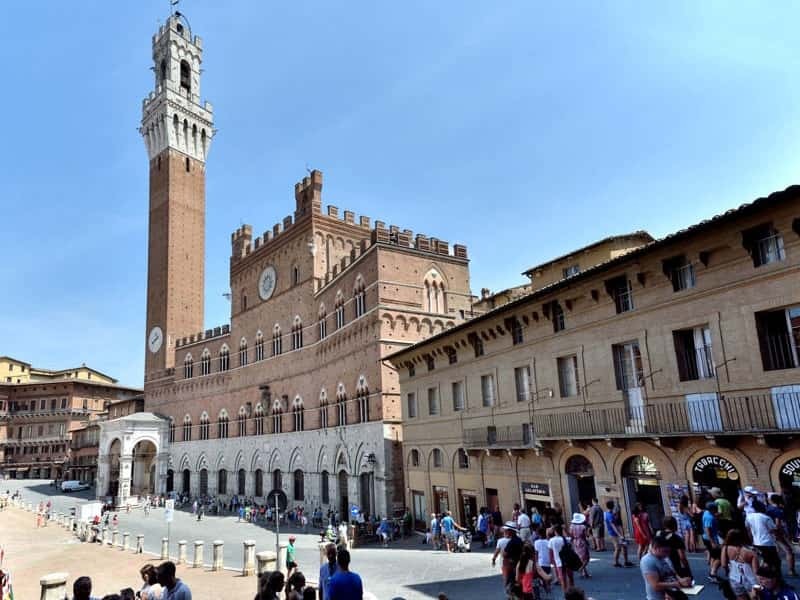 The square is surrounded by ancient buildings, such as the Torre del Mangia (built between 1338 and 1348) and the Palazzo Pubblico (built in Gothic style between 1297 and 1310) which houses the Civic Museum. Every year, on two occasions (July 2nd and August 16th)Piazza del Campo also hosts the traditional Palio: after the historical parade and the performance of the flags, riders representing the 17 city districts compete to conquer the trophy, also called "palio" (from Latin "pallium", meaning "mantle"). Today the prize is a silk cloth painted ny international artists (including, in the past, Renato Guttuso, Mino Maccari and Leonardo Cremonini). - the Duomo, dedicated to the Assumption, was built in Romanesque-Gothic style between 1215 and 1382, on the site where once stood a Roman castrum, first, and a bishop's residence, later. You will be immediately impressed by the rich ans imposing façade with polychrome marble and very valuable sculptural decoration. The bell tower, in Romanesque style, is characterized by black and white stripes and is topped by an octagonal pyramid with four side pinnacles. The building has the traditional form of a Latin cross, divided into three naves, dominated by polychrome marbles, statues of Popes and Emperors, the beautiful pulpit in Gothic style by Nicola Pisano, the high altar by Baldassare Petruzzi, the bronze tabernacle by Vecchietta, the window of the apse by Duccio di Buoninsegna, St. John Chapel with the statue of Donatello and the Chapel of Madonna del Voto, designed by Bernini. The marble decoration of the façade was realized by Giovanni Pisano. Many of the artistic masterpieces once on display in the Duomo, are now preserved in the nearby Museum of Opera Metropolitana, as for example, the Majesty and Madonna di Cevole by Duccio di Buoninsegna, sculptures by Giovanni Pisano, Donatello, Giacomo della Quercia and Giovanni Duprè. - the XIII century Church of Sant'Agostino, rich in polychrome marbles and paintings by Pietro Perugino, Francesco Vanni, Rutilio Manetti, Sodoma, Francesco di Giorgio, Luca Signorelli and Ambrogio Lorenzetti. - the Charterhouse of Pontignano, built in 1343 by the wealthy merchant Bindo di Falcone. It still preserves the typical architectural structure of the Chartusian monasteries. - Fonte Gaia, masterpiece by Jacopo della Quercia, realized in the upper part of Piazza del Campo, in the same place where once there was a fountain whose waters were brought there by 25Km of tunnels and underground passages. During the XIX century the original structure, very deteriorated, was replaced by a copy by Tito Sarrocchi, while the original one was moved to the Loggia of Palazzo Pubblico. - the National Art Gallery, containing examples of Sienese paintings of the XIII-XIV century (Duccio, Simone Martini, Ambrogio and Pietro Lorenzetti), XV century (Giovanni di Paolo, Sassetta) and XVI century (Domenico Beccafumi, Sodoma). - the Museum of the State Archives, housed at Palazzo Piccolomini, where the famous Biccherna tablets are on display: 350 registers, many of which with wooden and painted covers, related to the financial and administrative offices of the city. The collection is very valuable: the tablets are remarkable from the artistic point of view while the registers represent a great documents of the economic dynamics of the city. - the medieval structures of the sources and pointed arches of Nuova d'Ovile and Branda as well as Porta dìOvile and Porta Romana. - Santa Barbara Fortress (or Medicea Fortress), built in 1560 by Cosimo I de' Medici. In the XVIII century the fortress was demilitarized and in 1937 was converted into a public garden where it is possible to enjoy a stunning view of the surrounding hills. - the Castle of the Four Towers, of medieval origin. This town web page has been visited 282,363 times.